DISCLAIMER: MAY HAVE SPOILERS FOR FIVE-YEAR OLD MOVIE. I am, once again, not getting any studying done and I am gonna have to attempt to go to sleep fairly soon since we are going to see That Movie (i.e., Avatar) fairly early. I'm watching - or mostly listening to - the commentary to Garden State, which I had never seen before tonight. (Actually I'm watching the commentary more than I might for some movies because there's some stuff I missed the first time through - my attention wandered and I didn't figure out the whole subplot about Peter Skaarsgard's character robbing graves until way at the end.) Five years in, Garden State is a parade of familiar faces - as a matter of fact, I'm going to have to make sure and show Rob the scene with Jim Parsons even if he doesn't watch the rest of the movie, because he loves Jim Parsons. I pretty much watched the whole movie with IMDb on the screen of the computer because I kept checking to see who the heck all these people were and why they looked so familiar. (This may be why I missed the grave-robbing business, actually.) I kind of love this movie - I think I identify with the fact that it's about recovering from depression, maybe. I don't know why I didn't see this before - I had heard from a lot of people that it was good. It's just one of those movies I never got around to seeing before. -- Oh, and if you're from Houston and you've had this movie in your Netflix queue and it said Long Wait, it may be because I've had it sitting here for about two months. Sorry about that. I'll send it back on Monday, really I will. I put Garden State on in the first place because the Dr. Who thing - "The Waters of Mars" that is - was coming on again (if you watch BBC America on Saturday nights, you probably know the drill as well as I do - old Dr Who/new Dr Who/Graham Norton and repeat) and I found it so depressing I didn't want to watch it again. I'm not sure if this had to do with the ending or with the Martian zombies, because I totally rolled my eyes when the guy turned into a zombie-Martian at the beginning. I know it's not actually supposed to be a zombie but it sure seemed like one. I'm so over zombies. I have a cold so I am an unhappy camper. I am sneezing and sniffling and hoping I don't have the flu - although I'm not all achy and stuff so probably not. I am still not getting much studying done, but at least being sick gives me a bit of an excuse. I watched the last episodes of "The Vicar of Dibley" last night, which I got it from Netflix and I had never seen before. I think the disk was called "Holy Wholly Happy Ending" (or was it "Wholly Holy"? I dunno) and it had the last two episodes on it - although according to IMDb, there was also apparently a Comic Relief special which aired after these, so they weren't technically the last. Anyway, I have watched scattered episodes of this show over the years but I hadn't seen these. And actually, apparently scattered episodes is all there are, really - I didn't realize it but they only ever made 24 episodes (in over 10 years) including the various specials. Actually it looked like it got to be like Dr. Who has been lately - all specials. British TV is weird sometimes. I knew I recognized the guy who played the Vicar's love interest but I had to look it up to figure out why he looked so familiar. His name is Richard Armitage, and he plays Guy of Gisbourne on the BBC version of "Robin Hood" - which I have been watching again lately, somewhat to my shame. I decided the reason I didn't recognize him even though I saw him on the (very) last episode just last week was because Guy of Gisbourne never smiles. Seriously, I really honestly think that character never smiled once in the whole series. Very angsty - so when I saw him smiling and acting like a normal guy I couldn't make the connection. I have also watched Wall-E several times in the last few days. And the commentary. And also Enchanted. I think I want happy endings at the moment, or something. I have also been attempting to study, but I'm reading the section about the nose, which is just making me more aware of how itchy/runny/miserable my nose currently feels. Ugh. Somebody just posted a bit on efw about the 80s show where the guy lived with his long-lost Mediterranean cousin, and y'know, I can see the faces of both lead actors in my head and I think I even remember the cousin's name (Balki, or something to that effect) but I can't remember the name of the show or the actors or, thank god, the theme song, nor am I sure I really want to remember any of these things - particularly the theme song - although I'm sure it will all come to me sooner or later whether I want it to or not, anyway. All I can think of is The Facts of Life, which of course is an entirely different obnoxious 80s show, although I know a lot of people remember it, or maybe both of them, amazingly fondly. Part of the problem, I think, is that many of the TV comedies of that period had totally unmemorable and conceivably interchangeable names - Family Ties? Different Strokes? Good Times? And it probably makes a difference that I was not a kid of the 80s, either. Alex P. Keaton was not one of my cultural touchstones, y'know? Anyway, I feel like the answers to this are right on the tip of my tongue, but I suspect I'd be happier in the end if I failed to remember. Not a chance of that happening, I know. I forgot to say that last night in the wee hours I watched season one of Mythbusters (which is only three episodes) in order to get away from the endless talk about you-know-who on the TV. It was very entertaining - rocket cars and exploding biscuit cans and whatshisname painted gold, like in Goldfinger. I was particularly interested in that last one because I remember a friend explaining to me about the girl (allegedly) dying from the gold paint and I was fascinated - I must have been seven or eight at the time. OK, I really ought to go study now. Tomorrow we are going to the Astros game so now much studying is likely to occur then, either. I went to Weight Watchers so it must be Wednesday. right about the time Rob was ready to go to bed last night, and I was so interested I really didn't want to stop. But I did. We would have gotten further, but I made the mistake of reminding Rob that "American Idol" was on. And then there turned out to be a new "House" episode on too. Aren't all the scripted shows supposed to be running out of episodes, already? It is late and I am tired, and I am thinking about making fudge. Am I crazy? Well, maybe so, but I may do it anyway. There is fudge. Usually, every time I cook, I end up thinking about the reasons why I don't cook more; one of the major ones is that it's a serious minepit for somebody with attention-deficit disorder. There's a million ways to screw things up - not only burning the food and the obvious things like that, but also the truly dangerous stuff - burning me, or somebody else, waving a knife the wrong way at the wrong time. (I have come close to doing that one before.) Anyway, the good thing about this fudge recipe is that you don't step away from it for even ten seconds while it's cooking, so there's no danger of even somebody as spacy as me forgetting about it. It seems to be fine, and I will probably make another batch tomorrow. But not tonight. I didn't really do much today. I played GuildWars a lot - the Wintersday celebration is in full swing so that gave everybody new things to do - and I wrapped presents, and we went to the grocery store. Then I played GuildWars some more, and goofed around... and then I made fudge at 1 in the morning. That's about it. 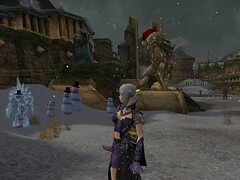 A screenshot from GW: my elementalist Rima in Lion's Arch.